We are in one of the busiest months in one of the busiest seasons in South Florida theater – at least 25 openings, and likely more. If you don’t see a review of a show that has opened while looking at the top of the front page, please scroll down the page or use the search function. When two cultures separated by language, history and geography collide in the musical The Golem of Havana, their similarities strike surprisingly thunderous resonances for protagonists paralyzed by the memories of a horrific threat they barely survived once before. This maiden offering from the Miami New Drama troupe at the Colony Theatre melds warm comedy and profound tragedy in an intriguing, sometimes moving, often thought-provoking evening. It encompasses the Holocaust, the Castro revolution, a hymn to a Yoruban deity, and Old World klezmer music pivoting instantly into a hot salsa celebration. As engaging as the score may be by composer Salomon Lerner and lyricist Len Schiff, the power comes from the ingenious script written by its director Michel Hausmann, the co-founder and artistic director of Miami New Drama. Hausmann asks whether those who have been betrayed like European Jews can ever trust enough to fully invest in relationships again. He also examines the dangers of dreams that have the potential for both good or bad consequences. The play begins as 14-year-old Rebecca Frankel says she is about to tell us her story — all she has saved after losing everything in some as yet revealed tragedy. But first she relates the venerated Jewish folktale “The Golem of Prague.” When the Holy Roman Empire seeks to wipe out the Jews in the 16th Century, a rabbi conjures a hulking monster of river clay called the Golem. The Golem kills off their enemies but then, without evildoers to attack, its innate murderous rage turns on his makers until the rabbi magically puts the Golem to sleep, perhaps to return someday when needed. Now in 1958 Havana, Rebecca depicts her parents who survived the Holocaust, Hungarian tailor Pinchas Frankel and his wife Yutka. Rebecca has nightmares about how Yutka and her sister were hidden from the Nazis by a postman who betrayed them when he came under suspicion. The sister died in the camps and Yutka emerged an emotionally-crippled pragmatic soul who trusts no one and nothing. “The Jews are always on the side that loses…. We are all alone,” she warns her husband who wants to take a chance on a brighter economic future with Batista’s patronage as the revolution in the mountains boils over. Although financially strapped, the family gets by with the help of their African-Cuban maid Maria. Maria yearns to hear from her 17-year-old son Teo who has joined Castro’s rebels. He secretly has returned to set a deadly bomb at a police station, wounding himself. He seeks shelter with the Frankels although his mother is out searching for him. Rebecca observes all this with eye of someone who draws comic books with a dreamers’ simplistic vision of villains vanquished by the Golem she imagined was put into a box that washed ashore in Cuba. She even ends up imploring a Yoruban god, seeking an answer to her worries. To reveal much more would spoil developments, but the Frankels find themselves in the same position as the postman in Hungary, culminating in a Sophie’s Choice decision. But these are not Rebecca’s storybook heroes; these are ordinary people caught up in the mad maelstrom of a too familiar tumult, trying to find the ethical and honorable thing to do. Hausmann’s second thematic strain has to do with the yin-and-yang of dreams. Hausmann is Venezuelan not Cuban. He paints Batista as the corrupt murderous self-satisfying dictator that he was and he paints Teo’s cause as noble in its intent. In fact, the revolution is indeed the Golem and for a while you wonder how this positive vision of the revolution is going down with the Colony audience that is likely heavily Cuban-American. But keep in mind the second half of the Golem fable. As a musical, the structure is pretty conventional with characters breaking into song when their emotions begin to crest. Lerner’s lively pulsing music is winning and delighting as it crosses genres effortlessly – played by a six-piece band that Lerner heads off stage. Schiff’s cleanly-wrought lyrics may be the weaker element – sometimes insightful, but often almost too simple and straightforward. The aura is of following a standard musical theater formula. They are saved on the stage by the passion he sought thanks to the singers investing themselves completely. The story also has some weaknesses: The true relevance of the Golem metaphor doesn’t coalesce until the last few scenes of the two-hour show. And as serviceable and diverting as the musical theater element is, you suspect it’s not really essential to telling the story. Hausmann has a theatrically stylistic flair for the visual. The opening fable is illustrated by projections on one side of a series of hanging white sheets and shadow puppet heads atop living actors on the other. Since this is consciously a story being told by Rebecca, the community of 11 actors observe the proceedings from chairs and crates lining the stage, and even add sound effects. Edwin Erminy’s minimalist set is dominated by hanging bamboo-blinds and naturalistic rolled on furniture. That puts the changing sense of place on lighting designer Mary Louise Geiger. Hausmann elicited heartfelt performances from his cast, but some of the cast have been with the show since its first incarnation and they have explored the territory now for a couple of years. It should be noted that while everyone has strong singing voices to bring out the depths of emotion, most performers noticeably failed to solidly land notes in the upper reaches of the score. Liba Vaynberg creates a Rebecca who is delightfully on the cusp of adulthood, but not quite there. She nails the sense of a misfit creative soul (a Jewish Jo March) whose naiveté is the persistence of pure humanity, compassion and imagination. Ronald Alexander Peet’s Teo is appropriately intense, consumed with a young man’s revolutionary fervor that is infectious. The father is given a genial persona by Allen Lewis Rickman. But Yelena Shmulenson gives probably the best performance as the mother haunted by the past and struggling to keep her family of dreamers from destroying themselves by foolishly trusting other people. 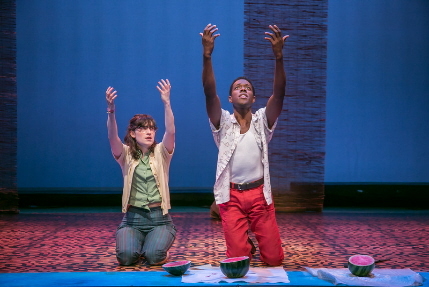 Rheaume Crenshaw delivers one of most stirring moments when Maria sings a prayer to the Yoruban sea goddess Yemayá with a fervent passion that resounds through the auditorium. One of the few local actors in a leading part is Chaz Mena, who was stunning Zoetic Stage’s Betrayal last season. As the neighborly huckster Arturo, Mena creates a believable creature who is personable when it suits him and coldly pragmatic when need be – morally comfortable making a killing selling supplies to the rebels while serving as an intelligence agent for Batista. Hausmann is a native of Venezuela where he was active in the theater. He produced this show first at the famed La Mama Experimental Theatre Club in New York City in 2013, then at the acclaimed Barrington Stage in 2014. Each iteration has been followed with rewrites and tweaks. This one not only bodes well for the future this piece but for future productions from this company.